As the final days of harvest wane, time seems to speed up as we approach the holidays. This year, we find it bittersweet as we come to the end of our 50th Anniversary celebration. Throughout this year, we have enjoyed the reminiscing, the looking back, the reflections on how far our family and company have come over the last five decades. We recognize that we simply would not be here today without the support of our talented staff, our hardworking growers, and most of all, our devoted customers. We are thankful that you have followed our story and our wines, and continue to share your fondness for both with friends and family far and wide. We are deeply grateful for the last 50 years…cheers to each of you. In 1991, I was 19 years old and looking for a job. My aunt came to me and told me that I should come to work at Bogle Winery with her. It was harvest, and they were looking for some seasonal help. I started working around the crush pad, cleaning the winery and pulling stems out of the crusher with a pitchfork. As harvest continued, they taught me how to do pumpovers. After that harvest when things slowed down, I left but it wasn’t long before I came back to Patty Bogle a few months later and asked if there was a job for me. I had liked working at the winery and wanted to continue. So I began working on the bottling line and doing whatever needed to be done. We all did, in those days. When I began, my English wasn’t that great, so it was a bit hard. I took classes at night, learned, and eventually began to feel very comfortable. I really enjoyed all the tasks that I had to do at the winery. It was hard work and long hours, especially during harvest, but I loved it. We would work many hours, take a nap on the futon in the lab when we got tired, and then in the morning, Patty would bring us breakfast. Fridays were also good days. We had production meetings outside around the picnic table in the afternoon, and Chris Bogle would bring cold drinks for everyone. There were just four or five of us working for the whole winery at the time. It was great. Eventually, I took over operation of the bottling line and drove the old, junk forklift. A couple years later, I started working more with the manipulation of the wines: filtering the lees, fermentations, and things like that. I have always felt that everything I’ve learned has come very naturally to me. It has never felt like work and I’ve enjoyed it all. 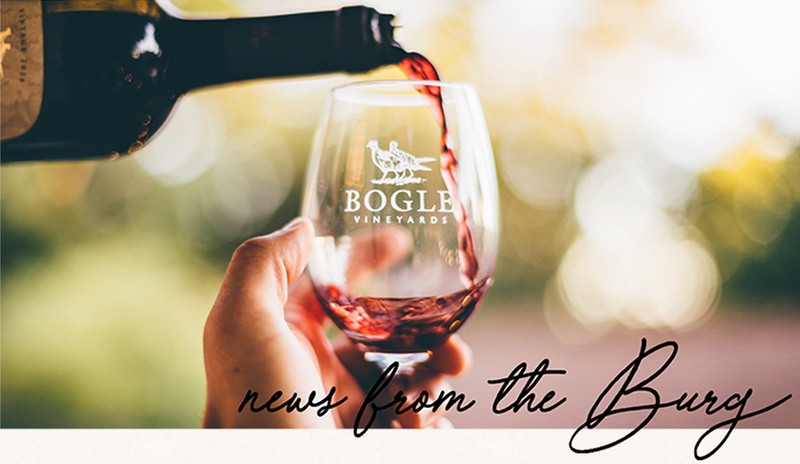 Now I am proud to be Bogle’s Cellarmaster since 2005, managing the manipulation of the wines under the direction of the winemakers. 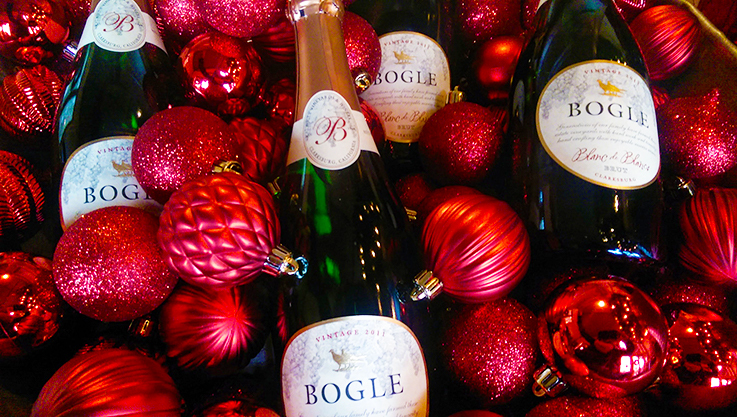 I have a crew of 24 full-time staff who I manage, and I still love working here at Bogle. 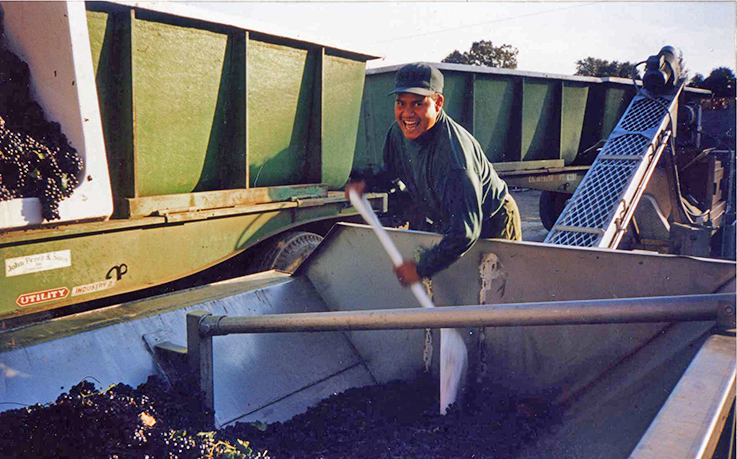 Pictured above: Bogle Cellarmaster Julio Lobato during harvest at Bogle in the 1990s. We know it can be confusing to figure out all the do’s and don’ts of the holiday wine and food gig. And while we are by no means experts on all things holidays, we thought we’d share with you what we are enjoying at various holiday soirees this year. With a big group comes an abundant beverage table, so it’s best to try to please a crowd. Go for something that is universally enjoyed by most wine drinkers. A safe bet is a Merlot or Chardonnay. These can be picked up on the way home from work at any retailer, and you’ll be sure to see an empty bottle when you leave. Because two weeks is a long time at home with the kiddos, they aren’t the only ones who enjoy playdates. If you and your momming BFF are spending an afternoon with blocks and dollhouses, try a Sauvignon Blanc. It is light and refreshing and is the perfect midday or afternoon sip. If it is an evening get-together, opt for the Cabernet Sauvignon. It will make watching “Frozen” for the 200th time palatable. Here’s where you need to step it up. It’s easy to take the gift giving to the next level with a bottle of our Reserve Petite Sirah, which is rich, luscious and age-worthy; or try the sparkling Blanc De Blancs, because, you know, bubbles. We know these are harder to find the further you get from Clarksburg, but you get the idea. Don’t skimp on this one. Not only is it a special occasion, but you’ll likely be enjoying the wine you bring to the festivities as well. This calls for something special, but still affordable, like our Phantom Chardonnay or Phantom Red Blend, at $16 or so a bottle. The grapes are hand-selected and handcrafted, using French and American oak barrels. Added bonus: when you hit that uncomfortable silence, just whip out your smartphone and show them the cool augmented reality animation by scanning the front and back of the bottle. This bottle is to reward yourself for getting all the pieces of that bike in the right places so your kid can pedal in the morning. Celebrate your success with an Old Vine Zinfandel. We also recommend enjoying it by the fire once you’ve got the bow on top of the handlebars. There will be food, there will be libations, and there could even be a fire pit with cigars if you live in certain regions of the country. Take and open up that bottle of Port that’s been gathering dust in the wine cupboard. The sweet, velvety goodness will be the perfect way to kiss 2018 goodbye and welcome all that 2019 has to offer!